Rosana was an amazing tour guide! She was very warm and personable. She even memorized all of our names in our small group so she could address us directly. We didn't have to wait in line at all. You can tell she loves Pompeii and gives her all to these tours. She was incredibly knowledgeable and we felt like she took us back in time to really imagine what life was like living in Pompeii. Definitely ask for Rosana. Highly recommend! 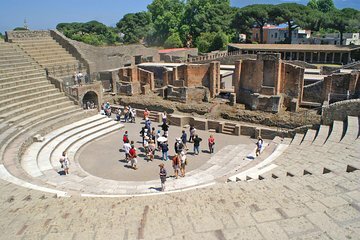 If you're in any doubt as to the best way to see Pompeii, stop looking and book this tour! There were only 6 in the group and our guide, Barbara, was absolutely superb. She met us at the coffee shop as promised and guided us past the long queues for tickets and to get in. The Pompeii site is very large and you'd need several days to see it all. As the tour is 2.5hrs, Barbara suggested what we should see on a large map and we went with her recommendations. We weren't disappointed! As well as showing showing us the 'best bits' of Pompeii, Barbara really gave us an insight into how the city worked, how the people lived and an understanding of what day to day life would've been like. We booked the 9am tour, so when Barbara left us at 11.30, I would've liked to spend more time exploring, but we'd planned to go up to the top of Vesuvius in the afternoon. I'd recommend you plan to spend more time exploring Pompeii on your own, once the tour is finished. Overall, I'd highly recommend this tour. This was the highlight of my holiday. Lello was fun, informative and took great care of his guests. I cannot recommend enough a wonderful experience. Go! This was my most expensive 'sight seeing' cost during my two weeks in Italy ... but it was SO worth it probably the best money I spent. Rosanna was amazing - friendly there were a lot of hello's back and forth with staff/other guides on site as we walked round, informative and despite it being busy inevitable she managed to get us around to the best spots without hitting upon any of the other groups - it's almost like we did a 'reverse' route. We only had a limited amount of time in Naples and the Amalfi Coast, so we chose to do this tour of Pompeii. It was perfect for us. We had Loretta as our guide. She was very knowledgeable and explained everything really well. Loretta also told some great stories and pointed out lots of interesting details and features that we wouldn't have known if we went to Pompeii by ourselves. Highly recommend. Lelo our guide was so GREAT! He was an archaeologist and so incredibly knowledgable. I learned so much about Pompeii. I have been once before without a guide, and this time was a completely different experience. This tour was definitely one go the highlights of my trip. We found this tour to be of exceptional caliber. Our guide, Lello, was superb. He filled the tour with interesting facts and lots of entertaining anecdotes. It was obvious that he is passionate about his subject and he kept us engaged the entire time. I highly recommend the tour. This was an amazing tour and THANK YOU Rosanna who was the perfect tour guide. I learnt so much and the guide made it a very enjoyable tour. Would highly recommend this tour, to anyone enjoys history. Our tour guide Roseanna was fantastic. I had been to Pompeii many years ago and took my wife and another couple to this tour. We chose the skip the line tour for our party of four so we could have a personal experience. 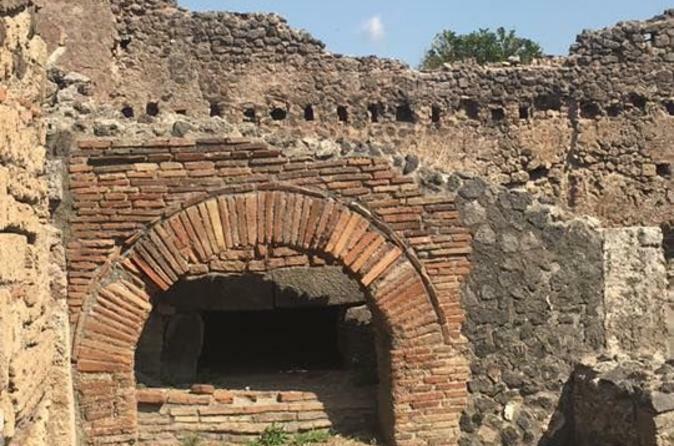 Everything we thought we knew about Pompeii was not exactly correct and Roseanna gave us a new understanding of this amazing place. She was extremely knowledgeable as she told us she had been a tour guide at Pompeii for 30 years!. Her communications skills were outstanding with facts and a little humor thrown in as she guided us along to explain what life was like in Pompeii. I highly recommend Roseanna and would recommend her to friends and family that want an amazing Pompeii experience.